If you want to check out some art for free, Sunday is one of the best days to take part. Tabla Rasa Gallery is the Sunset Park offering to this smART tour. 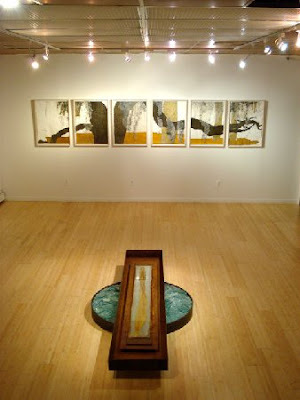 Tabla Rasa is currently showing Nobis Solo; the accompanying photo is from that exhibit. The HUB for the Green Loop (which includes Sunset Park) is the Brooklyn Museum of Art. So, if you want to sign up for it, you can get a visit in to the BMA as well as the other Green Loop stops (which goes through Crown Heights, Park Slope, Gowanus, Sunset, and Flatbush) and then "hop off" for Tabla Rasa on your way home. It seems like you have to get on at the beginning, but perhaps I'm reading it wrong. You can, however, hop on and off to enjoy whichever galleries on the loop you wish to see. Madarts on 18th and 5th has been especially good on previous open houses, so I recommend stopping there. Then you can get something to eat at Ellis or get a coffee at Southside (on 6th Avenue) while you're at it. people without reservations only after seating people with reservations! Please arrive at the hub location at least 15 minutes before departure. Schedules for each loop will be handed out on the bus.